Microsoft company has undergone global survey and introduced a new Sculpt range of Keyboards & mice with developed features designed to improve comfort for the users for a long period. The new accessories offer many useful features, like dedicated windows buttons & a split space bar. (a) Split Keyboard :- It is designed with curved shape of keys which allows the user's hands to sit in a more natural position. 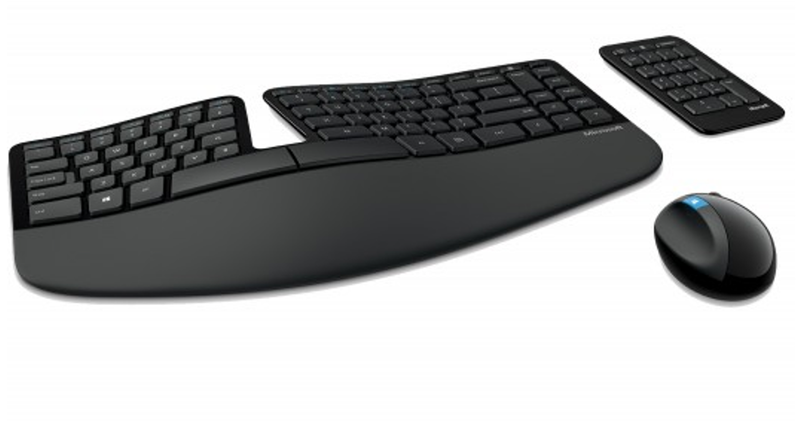 The curved shape of the deys isn't dissimilar to that seen on the company's more minimalist Arc keyboard. (b) Separated Number Pad :- The Number pad has been separated entirely from the main unit,which gives more options when it comes to desk layout. The palm rest is large & cushioned which gives more comfort during prolonged use. (c) Ball-Shaped Mouse :- The Mouse was designed with Ball-shape which encourage a more natural hand, wrist, and forearm posture. (a) Comfort Keyboard :- The Comfort keyboard design appears to borrow heavily from the company's aforementioned Arc keyboard, with a curved typing area and a flatter numerical area over to the right. The keys on both of the new keyboards are contoured to match the shape of the fingers, and the Comfort also offers a detachable palm rest and a split space bar half of which is reserved for backspace functionality. (b) Comfort Mouse :- The mouse is made with more traditional design, it has a dedicated windows touch tab and through open apps we can swipe up and down over the windows key to view or cycle. (c) Price :- The Sculpt Comfort Desktop set retails for a more wallet-friendly $79.95, with the keyboard on its own coming in at $59.95 and the mouse at $39.95.